The Miami blue butterfly (Hemiargus thomasi bethunebakeri) is one of the rarest insects in North America, with only one viable population remaining in the wild in the lower Florida Keys. The butterfly fauna of southern Florida are some of the most endangered species in the continental United States, with at least 15 endemic butterfly species found only in south Florida and the Keys. Most of these unique butterflies inhabit tropical hardwood hammocks or pine rockland, habitats which have largely been converted to urban development. The Miami blue butterfly is the only subspecies of Hemiargus thomasi in the United States. It is a coastal butterfly that inhabits sunny areas at the edges of tropical hardwood forests in southern Florida. The species warrants immediate emergency listing because the population and habitat of this unique butterfly is disappearing at an alarmingly fast pace. Although the Miami blue butterfly could once be found as far north along the Florida coasts to about St. Petersburg and Daytona, its range has been shrinking for many years. The species is now restricted to one isolated population at Bahia Honda Key State Park, estimated to be only 45-50 adults. The Miami Blue butterfly was once common in the coastal areas of South Florida, but much of the butterfly’s habitat range is now heavily urbanized. Coastal development and spraying of toxic chemicals as part of Florida’s all-out war on mosquitoes caused the population to drop to critically low levels. After Hurricane Andrew swept through the southern Florida in 1992, the Miami blue butterfly was presumed to be extinct. It was rediscovered in 1999 at Bahia Honda Key State Park. The Miami blue was a coastal species dependent on coastal trees and shrubs in tropical coastal hammocks (forests) and scrub, and once ranged as far north as Hillsborough and Volusia Counties in Florida, and southward along the Florida coasts to the Marquesas Keys to the west of Key West. The butterfly also occurred in pine rocklands (slash pine with small palms and a grassy understory) on Big Pine Key and presumably in Miami-Dade County. Much of that habitat now destroyed and remaining habitat is severely fragmented. The entire coastline of Palm Beach, Broward, and Miami-Dade Counties has been converted to dense urban development, and only small remnants of coastal vegetation are conserved in parks. In undeveloped coastal areas, the larval food plants for the butterfly are often displaced by invasive plants. The known larval food plant for the Miami blue butterfly is the gray nickerbean - other members of the pea family, such as Acacia may also be utilized. The Miami blue butterfly’s rarity makes it vulnerable to random events such as hurricanes or freezes that can temporarily destroy the foliage of larval food plants. Two major threats to the species are continued habitat loss and fragmentation of remnant habitat. 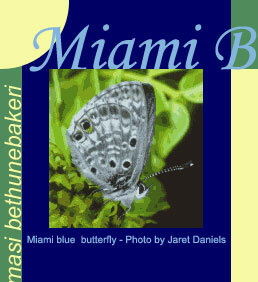 Fragmentation of habitat may not allow Miami blue butterflies to disperse between patches of suitable natural habitats. Other threats include mosquito control measures, vegetation management on public land (particularly the lack of prescribed fires and suppression of natural fires, since appropriate native plant species required by the butterfly are not maintained), and the potential for unethical butterfly collection. Because of these concerns, in June of 2000 the North American Butterfly Association petitioned the United States Fish & Wildlife Service (USFWS) to list the Miami blue butterfly as an endangered species under the federal Endangered Species Act (ESA), on an emergency basis. The USFWS initially made a 90-day finding that “listing this species may be warranted.” Under the ESA, the USFWS was required to issue a listing determination by June of 2001, but failed to meet this deadline. In November of 2002 NABA petitioned the State of Florida to designate the Miami blue butterfly as a state endangered species. The State of Florida acted quickly and in December of 2002 declared the Miami blue butterfly to be a state endangered species, on an emergency basis. The USFWS proposed emergency listing of the Miami blue butterfly several times between November of 2000 and December of 2004, in recognition of significant population decline and increasing harm from known threats. However, senior USFWS officials in Washington declined to issue an emergency listing because of an existing captive-bred Miami blue butterfly population, despite the fact that the inclusion of a captive-bred butterflies could result in inaccurate population numbers and the loss of the species in the wild. In 2005 the USFWS acknowledged that reintroductions from captive breeding has not been successful, since Miami blue butterflies have not become established at any of the release sites. Instead of granting endangered status, the USFWS listed the Miami blue butterfly as a candidate species in May of 2005, stating that ESA listing was “warranted but precluded.” The Center filed notice of intent to sue challenging this determination in June of 2005. Federal courts have repeatedly ruled that the USFWS has illegally placed gravely imperiled species on the warranted but precluded list as a delay tactic to avoid ESA protection.